The mind of a Gemini woman in love personality is always interested in bringing in new information and learning new things. There is no idle gossip from a Twin female. All the communication will be information dense and serve as an exchange of self between yourself and them. All of this is driven by their mercurial nature, and a talented conversationalist can engage a Gemini woman for hours. Gemini women are the ultimate social butterflies. You will find her calendar absolutely packed with many activities. You may find that she has breakfast with a friend before work, a lunch-time spa date with the girls, dance lessons after work. And she will still come home to prepare dinner, all with a bright and cheerful smile upon her face. The drawback is that she will, of course, be hard to pin down in any way. The Gemini woman in love personality traits show that she will always be eager to be up and off to do the next thing on her agenda. You’ll need to keep up with her if you want to keep her interest, so be prepared for a busy life with the Gemini female. If you’re trying to attract the attention of a Gemini female, it’s best to stimulate their always active and inquisitive minds. Figure out what she’s interested in and strike up a conversation about it, or bring up a topic you yourself love. The Gemini woman in love personality is a dynamic and versatile creature. They flow from love interest to love interest like a butterfly flitting from flower to flower. The Gemini woman in love traits show that in social gatherings their charm and fluidity makes them incredibly popular, as they flow from conversation to conversation, social group to social group, forever fluid, interesting, and bright. This will result in this Gemini lover being very popular, with many admirers of both genders seeking out a moment in her light. Know that her time for you will have to be carved out of her active social life, an element of her existence that is absolutely paramount to her health and happiness. An introverted Gemini lady is a rare thing indeed, so be prepared to involve yourself with an active and visible partner. The Gemini woman in love characteristics show that these women are not terribly prone to or connected to security and stability, especially not in love. They are versatile and mobile, and can get bored and distracted from what’s right in front of them. However, it is not impossible for security to be a draw for them. As we’ve established, this Gemini personality is not terribly good at providing a solid foundation for itself, being far more interested in the airy and ephemeral areas of cerebral and social interaction. If you are dating a Gemini woman, you need to keep up with her and provide a stable touch-stone for her otherwise fluid and chaotic life. This may be the very thing that draws her to you. Gemini women aren’t good with ‘foundations’. 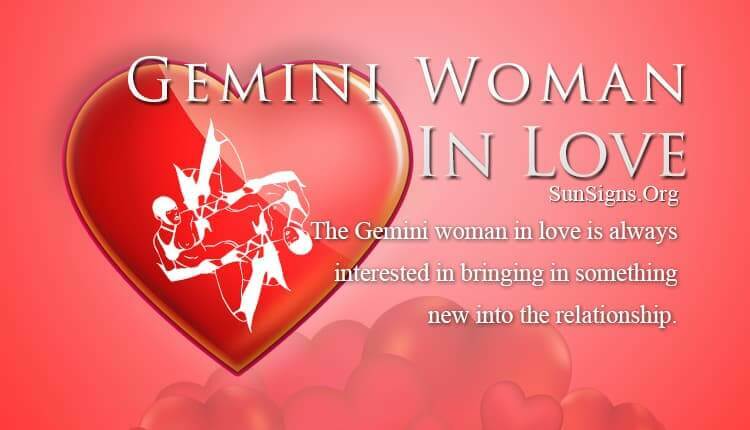 The Gemini woman in love traits show that they have a strange approach to fidelity and sexuality. They tend to not be possessive or overly concerned in bed. On one hand, it’s a ‘what’s good for the goose is good for the gander’ situation, she will have her infidelities, and allow you yours, as long as she knows you’ll come home after. She doesn’t tend to react with jealousy if she shares good love compatibility with you. But she does require clear communication, a sense of fun and adventure, and freedom from possessiveness. The Gemini woman in love characteristics show hat if you’re looking for a long term commitment, which can be difficult to get out of a Gemini of any stripe, and the women are no different. They need dynamic interactions, flowing energy, and the freedom to keep active and explore new and wonderful things. You’ll need to provide that in your relationship with her if you expect her to remain interested and devoted. Trying to cull out their friends and family is the absolute worst mistake you could make if you wish to keep your Gemini lover happy. All in all, when being in love with a Gemini woman, know that your life will be full of energy and zest, with new people and experiences coming in and out of your life every day. The Gemini woman in love personality traits show that you, as part of her life, will have to know that you will be part of a grand pageant that will always have new and interesting faces walking through. If you can stand it, she can be a very lively and interesting partner, with a grand life ahead.